With the popularity of flipped classrooms showing no sign of waning, a new crop of web tools for teachers are emerging to help support instruction. In this post, I take a look at four ways that teachers can add questions to a YouTube video for their students to answer when watching a video at home or on their own. To get started, simply copy and paste the link to the video into the Educanon video builder. Then, add a question at the appropriate time in the video. Unlike the YouTube question editor, Educanon stores all student responses so you can go back and check for student understanding at a later date. Educanon is also in beta, but is currently free to use. The last site I am going to share is called EDpuzzle. It is a little more versatile in the sources it allows for your video with YouTube, Khan Academy, TED, National Geographic and more as supported sites. Once you have chosen your video you can trim the beginning or ends to get the content you really need. You can also record an audio track for the video to describe it in your own words or to relate it to what you have been doing in the classroom. If you don’t need a full audio narration, you can leave voice comments at specific points in the video. Like Educanon, you can create a class, add students and get a record of results as they come in from students who are watching your EDpuzzle videos. You can also assign a video as homework for students that are in your class. Edpuzzle.com is also a free service for educators, so feel free to check it out too. 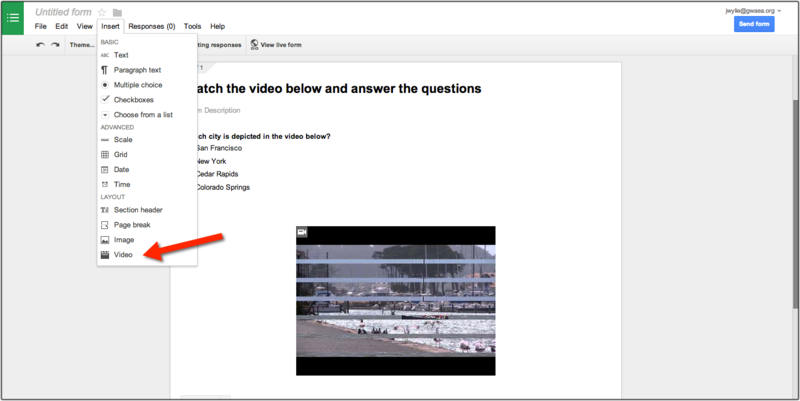 As a couple of people have reminded me on Twitter and in the comments below, the recent introduction of video to a Google Form means that you can now integrate a YouTube video alongside questions that you may have on a Google Form. All the student answers will be recorded on a Google Spreadsheet, and could potentially be graded for you with the Flubaroo script. This would work a little differently to the options above, because you cannot insert questions at a specific point in the video without splitting the clip and having several smaller clips. However, it could still be a nice option for teachers who are flipping their classroom and looking to add questions to a YouTube video. To add a video, create your form and go to Insert > Video, or click Add Item and choose video. Then paste the link to the YouTube video you want to use. So, the next time you want to add a little more interactivity to videos that you assign to your students to watch, check out one of the options above to help you add questions to YouTube videos. Online student response systems are increasingly popular right now. Socrative, InfuseLearning, and Nearpod are maybe the biggest players in this arena, but more are appearing all the time. So, how do developers make sure their app stands out from all the others? Simple, they do something that noone else is doing, and they do it well. Enter Kahoot! Kahoot! is a free, multi-platform, game-based classroom response system. It works on Macs, PCs, iPads, Android tablets, smartphones and just about anything else capable of running an HTML5 browser. So, it is great for 1:1 or BYOD classrooms. Once signed up, the teacher creates a series of multiple choice questions with which to quiz their students, and projects it onto a screen via an LCD projector for the whole class to see. Quiz questions may include an image or even a video for the students to use as a reference to help them submit their answer. A time limit of up to two minutes can be assigned to each question, but can be as short as five seconds for quick fire answers. How Educators Can Earn More Space With Dropbox for Free! Dropbox is a great service for syncing and backing up all your important files. You can access your files on the web, on mobile devices, and on any computer that you install the Dropbox client. It is, in my opinion, the best cloud backup and sync solution available because it works flawlessly. The only trouble is, you only get 2GB of space with the free account. These days, that fills up fast. However, there are ways to earn more space in Dropbox for free. Currently I have about 69GB of space, and none of it is costing me anything right now! Here’s why. If you already have a Dropbox account, you can earn more space by sharing a referral link with others. This is my referral link https://db.tt/fYqVNWw. If you sign up for Dropbox by clicking my referral link, we both earn an extra 500MB of space. You can earn up to 16GB of free space that way, but the person who follows your link has to create and account and install Dropbox on their computer before you are both credited with the extra space. As a disclaimer, I should state that I have already hit my 16GB referral bonus limit, but Dropbox tell me that you can still earn 500MB for yourself if you use my link. Got a Facebook or Twitter account? You can get 125MB of free space for linking it to either service or 250MB if you link both. Follow Dropbox on Twitter for an additional 125MB, and get yet another 125MB for giving them some feedback on what you think of their service. So, when all is said and done, 500MB of space can be earned for connecting with Dropbox. Do you Swipe? If you own a tablet or a smartphone, you are probably thinking that you do it several times a day. However, what I’m really talking about is a new online startup called Swipe. It’s an innovative, multi-platform presentation tool that works in any browser and on any screen size. Here’s how it works. Do you remember the first time you saw Nearpod, and your jaw dropped as everybody’s screen simultaneously advanced to the next slide when the presenter told you it would? Well, Swipe works in very much the same way, but there is no app, just a solid HTML5 platform that works seamlessly. You start by creating an account, and uploading your content to your first presentation deck. Swipe supports PDFs, Keynote files, JPEGS, PNGs, RAW files and more. (See a full list of compatible file types here). Next, name your deck, and rearrange the slides as you see fit by dragging and dropping. Want to add a video? Vimeo and YouTube videos can be interspersed among your slides simply by adding the URL to the video you want to show. Everybody needs to convert a file from one format to another at some point in time, and there are countless online websites that will do that for you. However, most specialize in just a few formats. Zamzar used to be one of my favorites, but, thanks to a tweet by Steve Katz on Twitter, CloudConvert.org is my new belle. Here’s why. To begin with, the service is free, at least for now, but it also lets you link up your Dropbox and/or Google Drive accounts to convert files that you store in the cloud, wherever you are. It can convert up to 139 different file formats, and can save your files locally, or to your cloud account. You can convert the same file multiple times to multiple formats, and choose to download a QR code so that you can scan it and save to a mobile device. Only need the first 30 seconds of a video? No problem. Click the wrench for advanced options that let you set the length of time to convert. There are advanced eBook reader options that let you specify which device you want your ebook file to be most compatible with, and there is even a handy Chrome app. In my own testing, I found the results to be very promising. It wasn’t perfect, but everything converted pretty much the way I expected it to. For teachers, there is not yet any option to convert SMART Notebook or ActivInspire files, but most other formats that educators use are there, and you can even do nice things like strip the audio from an MP4 video file and convert it into an MP3 audio file. The service is still in Beta, but if you find yourself doing a lot of file conversions, or dealing with formats that you would rather not work with, you should definitely try it out at CloudConvert.org. Evernote announced today that they are updating their terms and conditions. The new changes will take place on December 4th, 2012, and there are some concessions made to educators among the new terms. In the United States, if you are the sponsor of a Sponsored Group (the “Sponsor”), including an Evernote for Schools group, that includes children under the age of 13, you (or your school) assumes the responsibility for complying with the U.S. Children’s Online Privacy Protection Act (“COPPA”) and, to the extent applicable, The Family Educational Rights and Privacy Act (“FERPA”). This means that the Sponsor must notify parents/guardians of the information to be collected and obtain parental/guardian consent before collecting and sharing with the Service the personal information of children under the age of 13 in order to establish an account or use the Service. Schools may under appropriate circumstances provide such consent on behalf of parents/guardians. For more information on complying with COPPA, see the Federal Trade Commission’s website at www.ftc.gov/COPPA. I’m not a lawyer, so I am not going to make any further interpretation of the terms as they stand, but I think it is a positive move to attempt to address the use of Evernote in schools, and any possible confusion or misinterpretations of the previous terms and conditions that were not specifically aimed at the use of Evernote in schools. I am sure that there are already teachers out there that are already using Evernote with students under 13 because they have had parents set up the accounts in their names for students to use, or parents have signed off on generic school created accounts, but with these new guidelines, educators have a clearer vision of what is and is not acceptable in order to comply with legal requirements and Evernote’s own terms and conditions. So, what do you think about the new guidelines for using Evernote in Schools with those under 13? Does your school use Evernote with students who are under 13? How do you get around the legal implications of such a move, and would you be willing to share any of the documentation you send out to parents about this? Please share any feedback below.